I haven't had a lot of time lately to just make a card, as I am getting ready to attend a craft fair in about 6 weeks, that's why you have been seeing a lot of card packs and 3D items from me lately! The first card I made was a Thank you card for a friend, so it will be sent off in the mail tomorrow along with some new goodies for her play with. I hope she likes it... I was happy with how it turned out. What do you think? I will be back later to show the others. 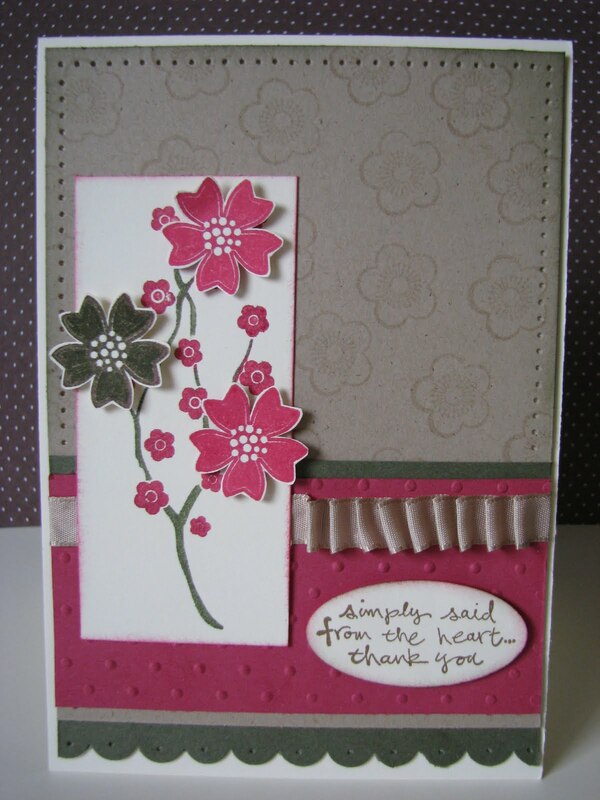 This is a gorgeous card, Tammy. The colours were really lovely to play with. I love the new blog look, it's great!!! Lucky Friend..... your card is very, very nice. and its nice to see you back on the challenges, and with a new look blog too. Oh I love it. I love how you used the smaller flower in the background. I really like how you added the larger flowers to the eastern Blooms branch, and the piercing and ruffled ribbon details too. This is a great card Tammy! I love all the different textures and layers. Beautiful, Tam. I love the embossing, background stamping, paper piercing, the ribbon .... all of it!! Beautifully put together, and I am sure your friend will LOVE it.